The Export-Import Bank’s actions have left taxpayers exposed to $72.5 billion in risk, primarily through its loan guarantee program. American taxpayers risk losing billions of dollars owing to the actions of the Export-Import (Ex-Im) Bank. In the context of government ventures, “exposure” measures the maximum amount that taxpayers stand to lose. Ex-Im’s mandate exposes taxpayers to billions of dollars of losses as it insures loans, makes loans, guarantees loans, and provides working capital ostensibly to support American exports each year. Worse, private investors would be able and willing to fund the vast majority of these investment opportunities, so there is no plausible reason to continue exposing taxpayers to this risk. The financial exposure of an organization, whether public or private, is the maximum amount it could lose on its investments. 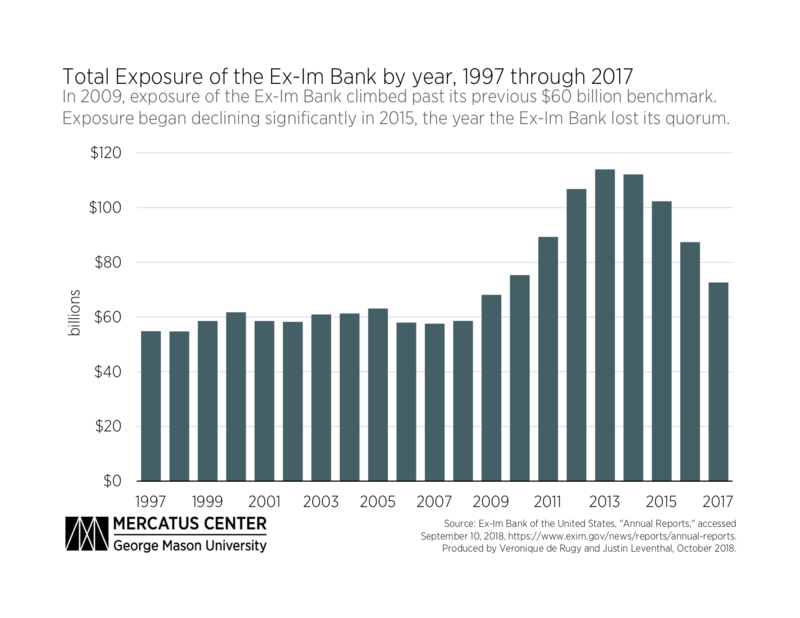 From 1997 through 2008, the Ex-Im Bank maintained approximately $60 billion in exposure through its programs. However, in 2009 the exposure of the Ex-Im Bank began rising until 2013, when it reached $114 billion. This amount fell by $2 billion in 2014, but large drops in taxpayers’ exposure did not take place until 2015, the same year the Ex-Im Bank lost its quorum and thus its ability to approve commitments of over $10 million. 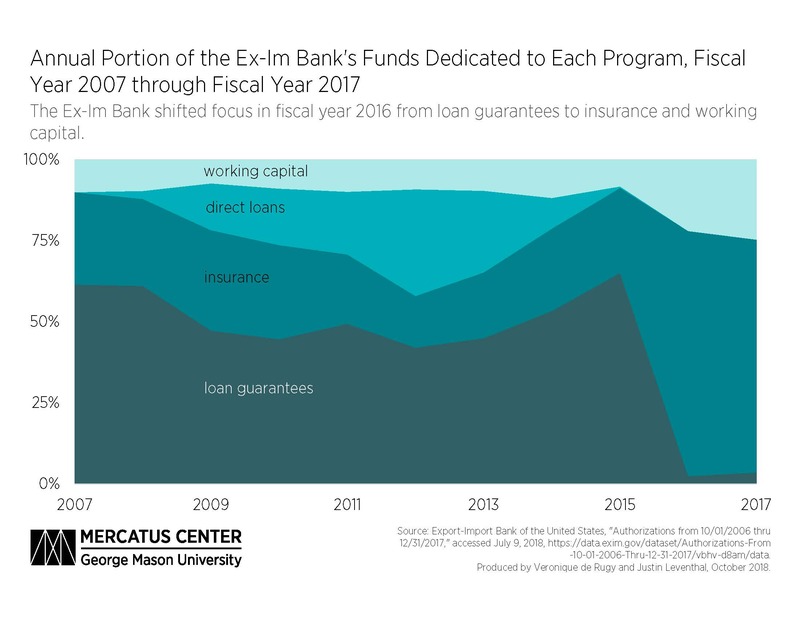 The risks taxpayers face from the Ex-Im Bank are driven by four different programs: insurance, loans, loan guarantees, and working capital. These programs have not represented equal portions of the Ex-Im Bank’s financial exposure. Loan guarantees represented nearly half of all the bank’s financial commitments, followed by insurance at just over a quarter. Breaking the exposure down year by year shows a more drastic difference after 2015 than before 2015. 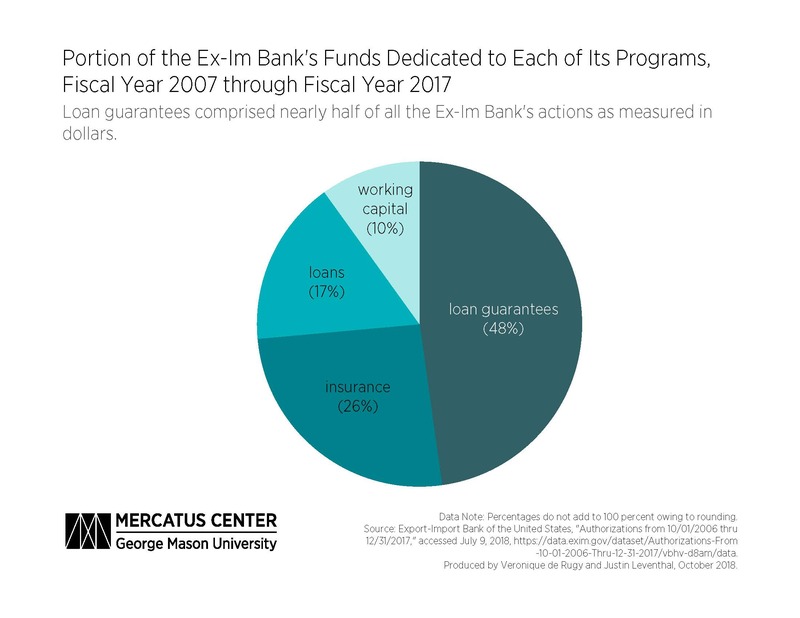 From fiscal year (FY) 2007 through FY 2015, the smallest portion of Ex-Im Bank funding dedicated to loan guarantees was 42 percent. However, in 2016 this portion dropped to 2 percent. The opposite pattern was true for the Ex-Im Bank’s insurance and working capital commitments, which each jumped starting in FY 2016. Lastly, direct lending stopped entirely in FY 2015. Even if one were to take the Ex-Im Bank’s stated purpose at face value, it is worth asking if exposing taxpayers to this risk is even necessary, considering that investors are competing to fill the void for the largest industry the Ex-Im Bank supports, aeronautics. The eagerness of private investors to move into this area as government action has moved out demonstrates that the Ex-Im Bank’s actions, which led to this taxpayer exposure, have crowded out those private investors who would be willing to take on risk, and who would do so without exposing taxpayers to a combined total of $72.5 billion in risk, as of 2017.